In the early days of civilized Utah, Masonry could have been considered an endangered species. Masonry was limited to a traveling lodge of military men based at a camp formerly known as Camp Crittenden, now known as Camp Floyd. This military lodge was chartered as Rocky Mountain Lodge No. 205 and operated until 1861 when the camp was closed and the troops were sent to fight in the Civil War. The lodge surrendered its charter at that time. During the subsequent time period, as far as available records show, there was only one documented event in which Masons participated, a funeral for a Lieutenant Chase, who was killed in the Battle of Bear River January 24, 1863, however there was no active lodge. Lt. Chase is buried in Mt. Olivet Cemetery. Things changed in the summer of 1865 when J.M. Ellis, an owner of a general mercantile business in Salt Lake City began corresponding with W.A.M. Van Bokkelen, Grand Secretary of Nevada. During this correspondence Brother Ellis made inquiries concerning the “steps necessary to be taken to secure a dispensation for a Masonic Lodge.” And, on November 11, 1865, the Salt Lake Brethren held their first meeting at Odd Fellows’ Hall for the purpose of perfecting an organization in preparation for obtaining a Masonic charter. This notice was signed by W.L. Halsey, President, and James Thurmond, Secretary. From this, we can deduce that the meeting on Nov 11th included the election of certain officers. This notice also has historical significance, because it was the first Masonic notice ever published in a Utah newspaper. “THE MASONIC ORGANIZATION-One of the most cheering signs of the civilization of the times in Utah was the imposing procession and the interesting exercises, on the occasion of the organization of Mt. Moriah Lodge U.D., F. & A. M., in this city on Monday afternoon. “The affair was novel in this city of Saints, and certainly significant of elevating innovation and of progress in this heretofore proscriptive part of free America. At 2 o’clock P.M. the members, numbering between 50 and 60 from the civil and military citizens (gentiles) marched in full Masonic regalia from the Lodge Room through the principal streets on their way to Independence Hall, and headed by the splendid Military Band. This was just one of many instances of Salt Lake City based Masons holding an event in grand fashion. Shortly thereafter, more “grand” events took place. Mt Moriah members held a well attended “Grand Masonic Ball” on February 22, 1866, in honor of George Washington’s Birthday. And St. John’s Day was celebrated with a “Masonic Festival and Ball” on June 25th, 1866. All events were very well attended, and raised significant funds for the cause of masonry. While these festivities were going on, seeds of friction festered between Mt. Moriah, and the Grand Lodge of Nevada. The Grand Lodge of Nevada issued a directive excluding petitions from Mormons, including visitations by Mormons who were Masons, to receive the benefits of Masonry. Members of Mt. Moriah believed it was contrary to the principles of Masonry to exclude a man based on religion and thought it was proper to initiate qualified Mormons who were not practicing polygamy. In 1926 the Grand Lodge of Utah passed legislation that prohibited Mormons from becoming Masons. That discrimination was revoked in 1983 and no such religious discrimination exists today in any Utah Masonic Lodge. Masonry is a fraternal organization open to all men that profess belief in a supreme being, regardless of the definition a man may apply to his higher power. Lodge members and leadership objected to this exclusion on the grounds that prohibiting Mormons would be in direct violation to the principles of equality and free thought that Masonry stands for. At that time, however, The Grand Lodge of Nevada did not agree and threatened to revoke Mt Moriah’s charter to act as an authorized Masonic Lodge. In spite of numerous petitions to the Grand Lodge, regarding this matter, Mt Moriah’s dispensation to operate as a Masonic Lodge ended on September 1st, 1867 and was not ultimately reinstated until three months later, November 25, 1867. After Petitioning the Grand Lodge of Montana and the Grand Lodge of Colorado for a charter, both of whom declined to intervene in the decision of the Grand Lodge of Nevada, Mt. Moriah’s officers petitioned the Grand Lodge of Kansas on October 15, 1867 which then granted Mt. Moriah Lodge a charter, No. 67, on November 25, 1867. Mt. Moriah surrendered its Kansas No. 67 charter on February 5, 1872, when the Grand Lodge of Utah was formed and Mt. Moriah Lodge No. 2’s charter was issued. While Mt. Moriah Lodge is the oldest operating lodge in Utah, it was not issued the No. 1 designation due to the three month lapse in our charter between the dispensation from the Grand Lodge of Nevada and the No. 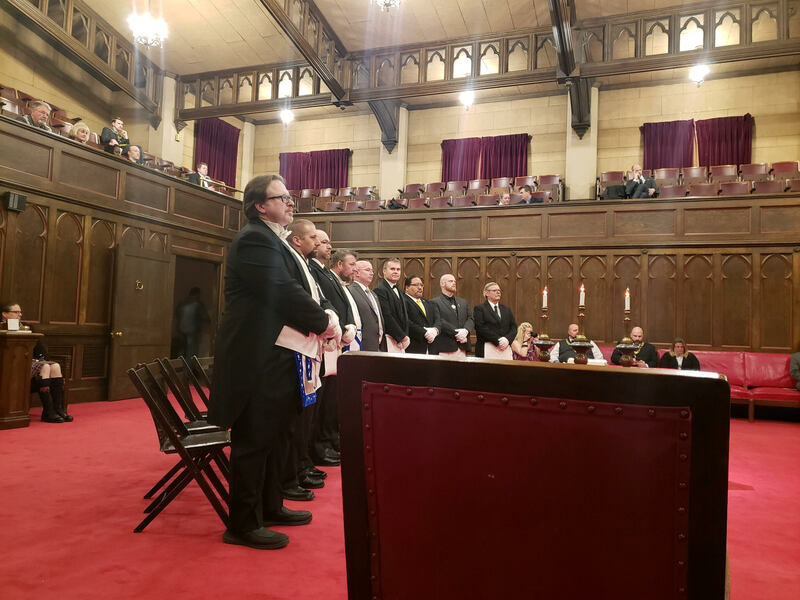 67 Charter issued by the grand lodge of Kansas. Thus, Wasatch Lodge became No. 1 when the Grand Lodge of Utah was formed. This gap is a source of great pride among Mt Moriah’s fraternal members. It reminds us of the strength our early brothers exhibited in the crusade to do what is right and correct, regardless of the consequences, all the while, remaining steadfast to the principles that govern all Masons: brotherly love, relief, fortitude, prudence, temperance, justice, and truth. As members of Mt Moriah Lodge No. 2, we continue to follow the same principles that drove the founders of our lodge, striving for the moral strength to be considered by society upright men. We are built on a noble foundation.